Speaking at the opening ceremony of Phnom Penh’s third ring road, the prime minister hit back at the criticism saying: “Their houses are made of wood. They use luxury wood such as Beng, Neang Nuon and Thnong. “One day, I will go to their 100 homes and demolish them to take back the wood, leaving only cement. That will show those who accuse me of deforestation. [I will ask] where you got this wood from?” he said. The prime minister’s comments came following a damning January 7 report published by the Prey Lang Community Network (PLCN) – a grassroots, cross-provincial movement working to preserve Prey Lang Forest. Using data collected through the group’s own smartphone app, the report highlighted the “concerning rate” at which logging continued to occur in Prey Lang Forest and criticised the government over its apparent inability to prevent it. 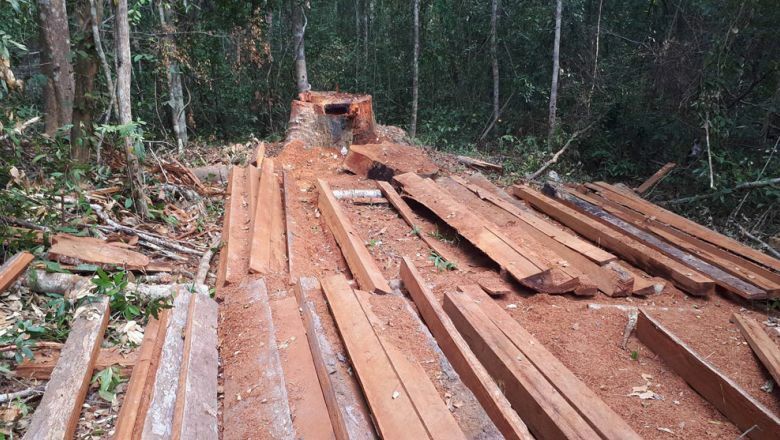 PLCN’s data claimed that 41 per cent of new stumps recorded in the sanctuary between September 1, 2017 and May 31 last year was the result of illegal logging, while 24 per cent of timber collected and hauled was done so illegally. The Ministry of Environment responded to the report by saying it was “polluting information”. Ministry spokesman Neth Pheaktra claimed that the group’s report was cynically motivated and merely an attempt to secure further funding for their ongoing preservation projects. He added that the group included some old data and included only negative points in the report to “destroy the people’s trust in the government”. Preah Vihear province’s Prey Lang community coordinating committee member Srey Thei on Monday labelled the prime minister’s comments unreasonable. He said it was undeniable that a lot of Cambodia’s forests have been lost and it was not the result of local activists using luxury wood to build their homes. “But using wood to build our homes does not destroy that much of the forest – at most, in one year we will build 10 houses, and in some years we build none. If we build houses, we do not use luxury wood, only ordinary wood,” he claimed. A senior investigating officer for rights group Adhoc, Soeung Sen Karuna, told The Post on Monday that the prime minister should not respond to critics in such a manner and instead look for a solution to deforestation in the country. “Instead, we all need to accept these criticisms and find the solutions necessary to prevent deforestation in Cambodia in the future,” he said.